Similar to the ever-popular 'Caesar's Brother' Iris, the 'Blue Diamond is just as splendid with the same sword like leaves! 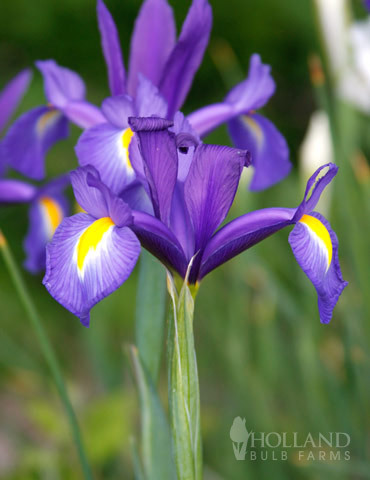 The yellow accent on each falling petal stands out against the rich purple and pops even more when combined with other yellow blooms, such as the 'Royal Yellow' Dutch Iris. Loved by your two-legged friends and hated by those with four-legs, this is sure to be a hit in the yard or your favorite vase! Symbolizes: eloquence, deep sentiment, faith hope & wisdom. February birth month flower. 25th Wedding Anniversary flower. The only irises I gave are a periwinkle color and there are a lot of them. I needed something different and I'm glad I found these. I can't wait to see them as an addition to the flower bed in the spring! I planted them in, upon receipt. Looking forward to them growing in the Spring.